For the last two years the 22nd March has meant ultrasound scans. Two years ago today Anabelle became Anabelle. 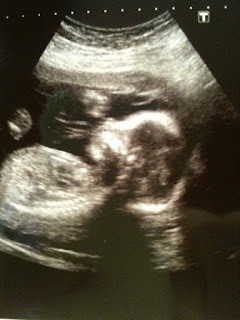 It was my 20 weeks scan and we 'met' our little girl, gave her her identity and started our whirlwind on pink shopping. What a high, we were so excited. If only we had known what was to come. I'm alarmed how quickly her 2nd birthday is approaching, I'm not ready for it to be two years. Two years without her. We should be anticipating the start of the terrible twos, but of course instead my toddler remains dead. Sometimes I still feel so angry at the injustice of it all. I watch Alexander and wonder how she'd have been like him at this stage. I enjoy him so much and just sometimes I look at him and hurt for her. Hurt that we weren't allowed to watch her grow too. Then there was a different scan. Alexander's first scan, exactly a year on from Anabelle's 20 week scan. I remember being amazed how it had fallen together. Today (well, like everyday really!) I've been wowed by our wonderful little boy. 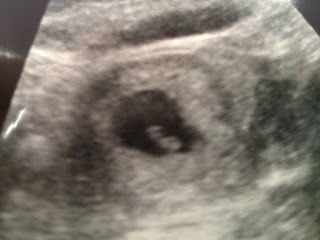 A year ago today he was a teeny little blob on the screen. We were so relieved to see his little heartbeat and mesmerised that something so tiny was our little baby. A teeny little Xander baby! He's absolutely gorgeous and looks very happy, you must be doing really well with him. I cannot imagine the pain you must still feel but you must look at him and feel joy. Anabelle will still be watching over him like any good big sister would. god rest her soul.